I was asked by members of SFPL to do a video of writing with a new novelty that I purchased from taobao recently, disappearing ink cartridges. 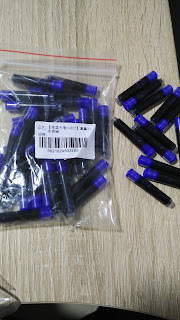 Originally, these cartridges are meant to be used with indented copybooks that is becoming popular in China, which was why I bought them in the first place, but I'm sure our beloved members will find ways to get into trouble with them. Be safe people, don't get caught.. The cartridges come in pockets of 30, under 10 Singapore dollars but shipping is a killer. I shipped two packets on top of the copybooks I purchased, doubt I'll be buying them solo. 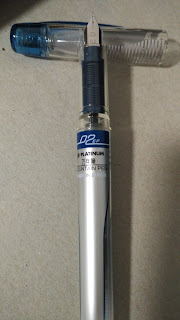 The pen used in the really poor quality video is a Daiso (4th generation) pen, the cartridge is an international short. 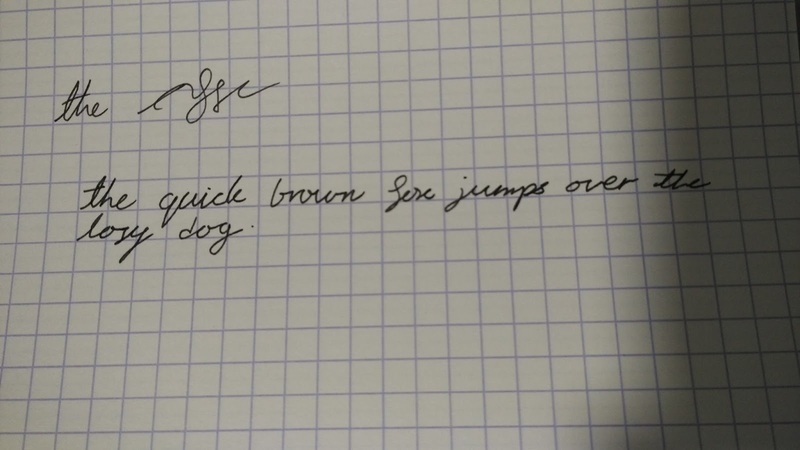 As you can see from the video, the ink starts to fade almost immediately, it will probably not be the best thing to open bad checks with, but not too bad for practicing writing. I'll play with it a little more and update this post if I discover anything else worth noting about this cartridge. 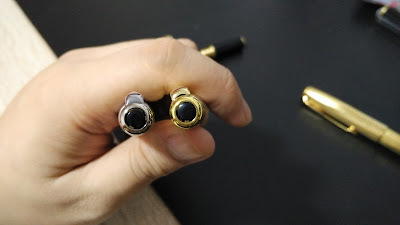 As the trend of fountain pen usage comes back in fashion, the rise in the number of counterfeit fountain pens occurs as well. For first time buyers, this can be a costly and embarrassing mistake, one which could be avoided by sharing information with fellow enthusiasts. I have the unfortunate honor, of presenting first hand information on the subject with everyone. While searching for a good deal on fountain pens in Ebay, I came across a Parker Sonnet at a too-good-to-be-true price. 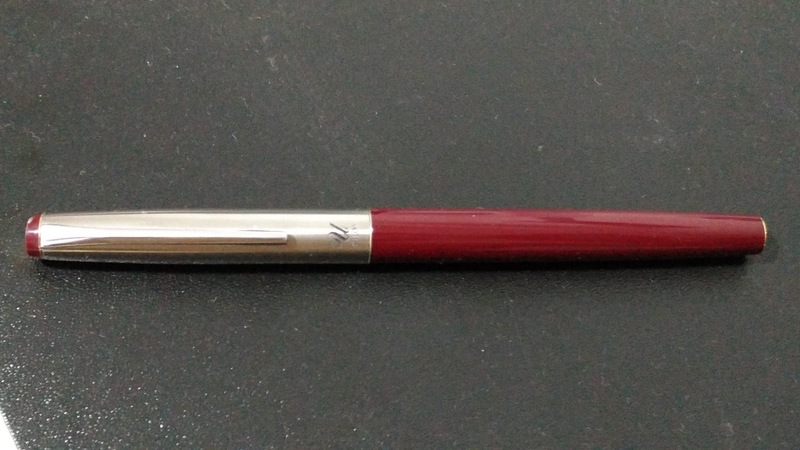 Despite noticing that the seller is from China, I threw caution, and common sense, into the wind, bid for the pen, and won. Went the pen arrived, it felt wrong right from the start. The weight of the pen was lighter than the rest of my Sonnets, and the material felt a little cheap. A closer look revealed workmanship errors which was uncharacteristic of the Parker Sonnets. Here are some comparison photos to help fellow enthusiasts in identifying counterfeit Sonnets. While the quality of lower end Parkers have been questionable these past few years, they have still maintained some standards in their mid and higher-end products. 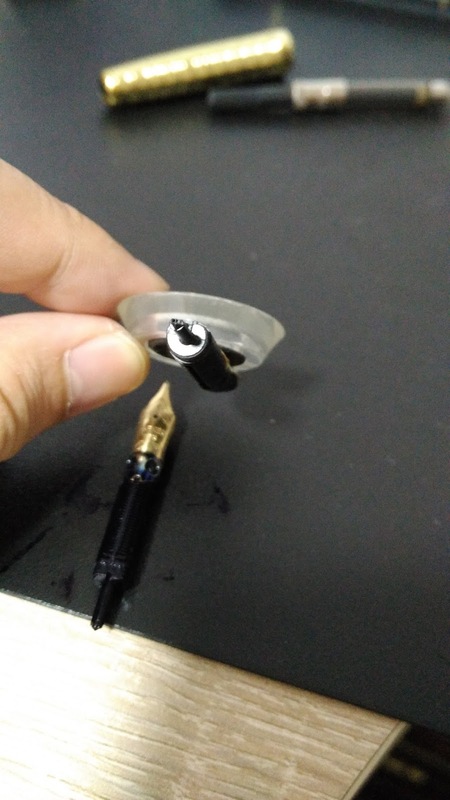 The plastic "Jewel" on the top of the Sonnet cap should appear center, as shown on the left, and not touching the edge like the counterfeit on the right. One of the things that eluded Parker counterfeiters, has been the "feather" lines on the Parker arrow clips. Most of the time, the lines will be too shallow or not clear enough on a counterfeit (as shown on the right), though this could be hard to detect without a comparison. Small details, like thread count, isn't something most counterfeiters pay too much attention about. 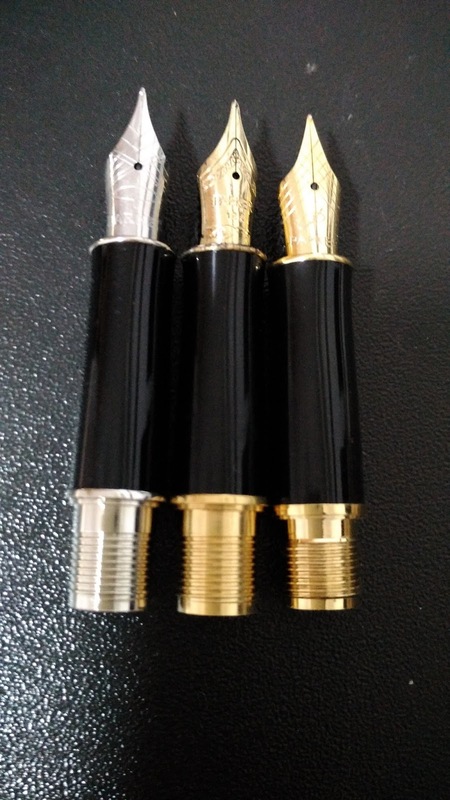 As shown on the right, this example of a counterfeit has a shorter thread than standard Sonnets, I have seen examples with longer thread counts in other Parker products. The thread count of feed to section is about 1 and a half turns on a standard Sonnet, but this counterfeit requires 3 full turns. 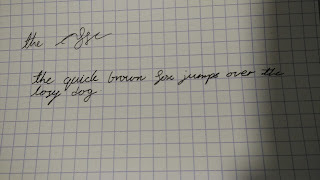 This is the first test which I use for any Parker pens which I have doubts on. Modern Parker nibs are made of a non-steel alloy and should not be attracted by a magnet. 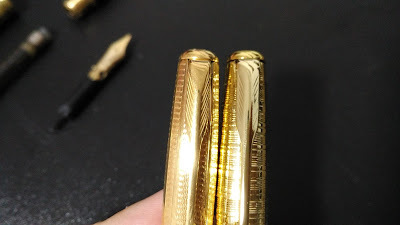 As you can see on the right, the "18k" nib is obviously not what it claims to be. Do note that counterfeiters have caught on recently, and I have a counterfeit of a Parker IM which can pass this test (failed the previous test though). 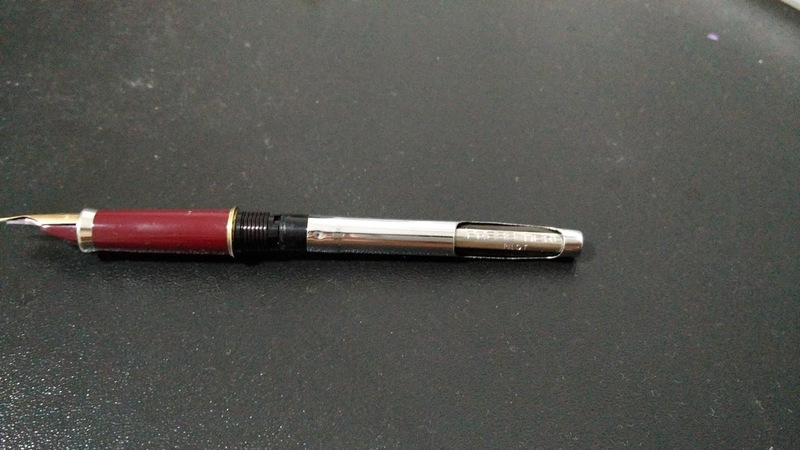 For the Sonnet, the nib of the pen is fastened onto the feed mechanically, and should be a secure, non-moving fit. This example of a counterfeit has a feed that moves away from the feed on slight pressure. I have already raised a dispute on paypal for this counterfeit, and even if I don't get my money back, the price I paid for it is low enough to be an inexpensive "lesson fee". Good hunting! If you have no idea what this series is about, please click here for a brief intro. 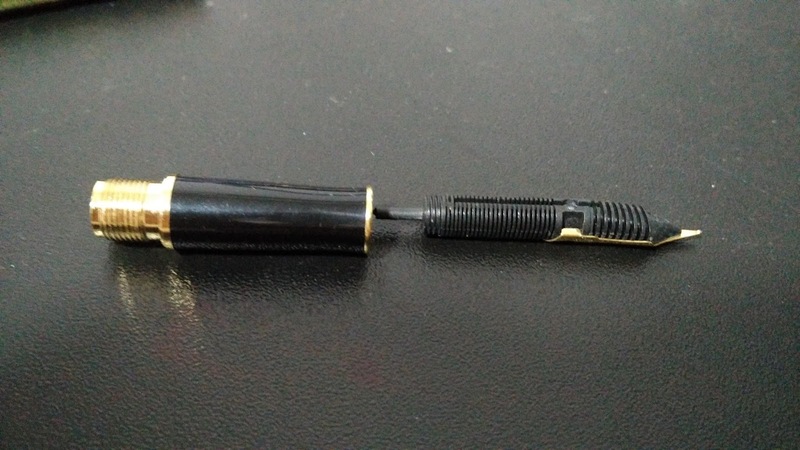 Yes, this pen was manufactured by pilot for a short while. 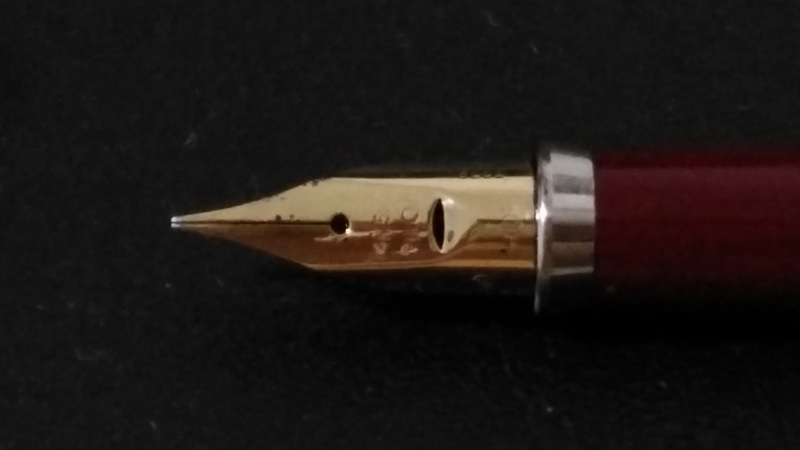 The pen came with 14k 585 nib, and the older version of the Con-20. It writes like a F nib and has a unique feed which seem to be joined to the section. I'm not sure if it is due to abuse from the previous owner or a design flaw, but somehow the Hero 336 nib feels smoother to write with compared to the Pilot U. At SGD $1.20 per pen in Singapore, the price of the Hero 336 is hard to match. With a removable converter, the Pilot U is a lot easier to clean and maintenance, compared to the Hero 336, where the plastic sac is glued directly onto the section. The Hero 336 looks and feels cheap, that has always been one of the main reasons why it has never been able to compete with more expensive pens, even though it is a decent writer. Hero 336s are notorious for the lack of QC, one of the more constant issues involves out-of-the-box ink flow problems, which requires some tuning before the pen is usable. 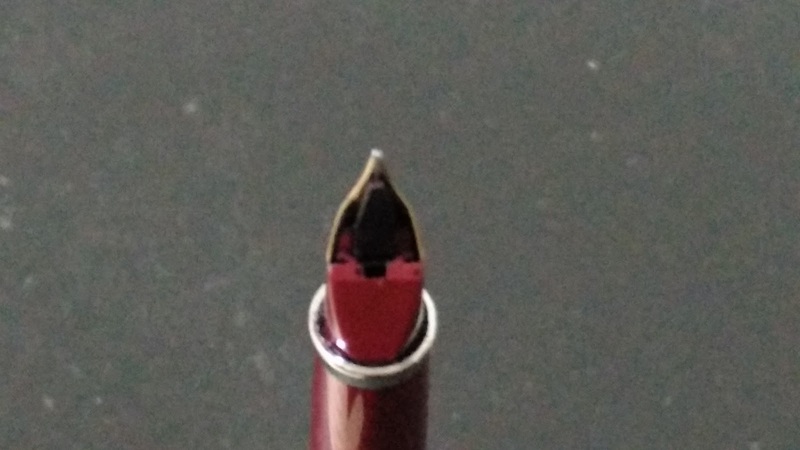 Again, the Pilot U has a hard start issue which I cannot determine, if it is due to abuse or design flaw. The Pilot U has a strong feedback when drawing across the nib. This could be due to the thin nibs which are not supported fully by the feed. The Pilot U is no longer in production, and will take some effort to acquire. In my (very) few attempts to review fountain pens, I found that it was very difficult to gauge the degrees of differences on a single pen. There are no scales or standards to compare them too, and the only way for me to judge was how I was feeling about the pen that day. To overcome this problem, I decided to use an inexpensive, widely available fountain pen to compare against the pens which I will be reviewing from this point. I chose the Hero 336 as it is still in production, cheap, and easily purchased over the counter or online. Announcing the beginning of the "Hero against the World" series, your constructive comments are very much appreciated. Ever since the EF nib was announced by Platinum for their preppy series last year, I have been trying to get my hands on one. Sadly, not many local dealers wanted to carry it, and buying it online meant paying twice the value of the pen for shipping, or more. So when I found out from fellow SFPL members that a local dealer brought in a batch, I rushed down to get it, only to be told that all existing stock was reserved. 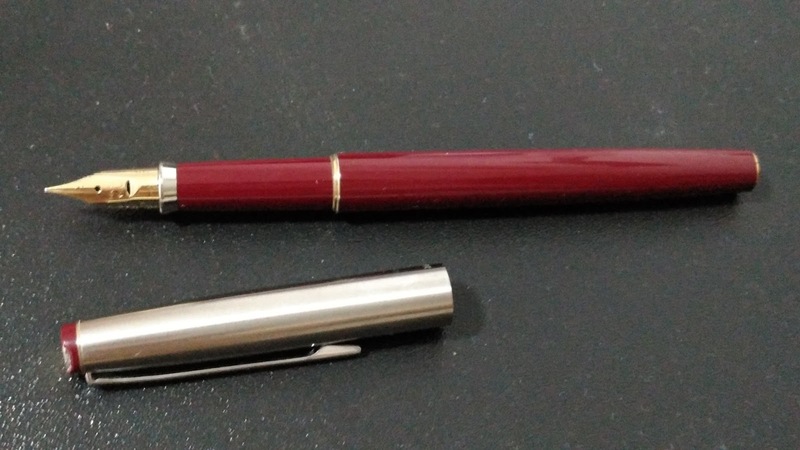 Enough ranting back to the review, the pen itself has a slightly different appearance than the 03 and 05 version, but the basic design is the same. Out-of-the-box, the nib was very scratchy and had too much feedback for me to write comfortably. Some light smoothing with a buffing stick, however, resolved most of that. 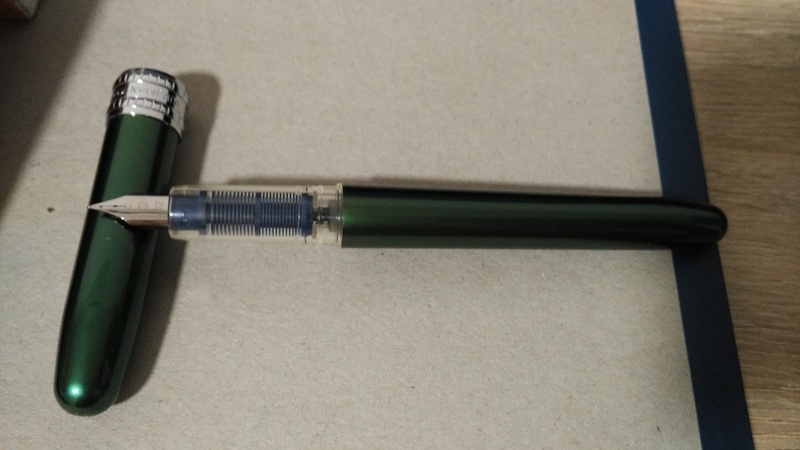 Fitted with a standard platinum cartridges, the ink flow was smooth and consistent when writing fast. 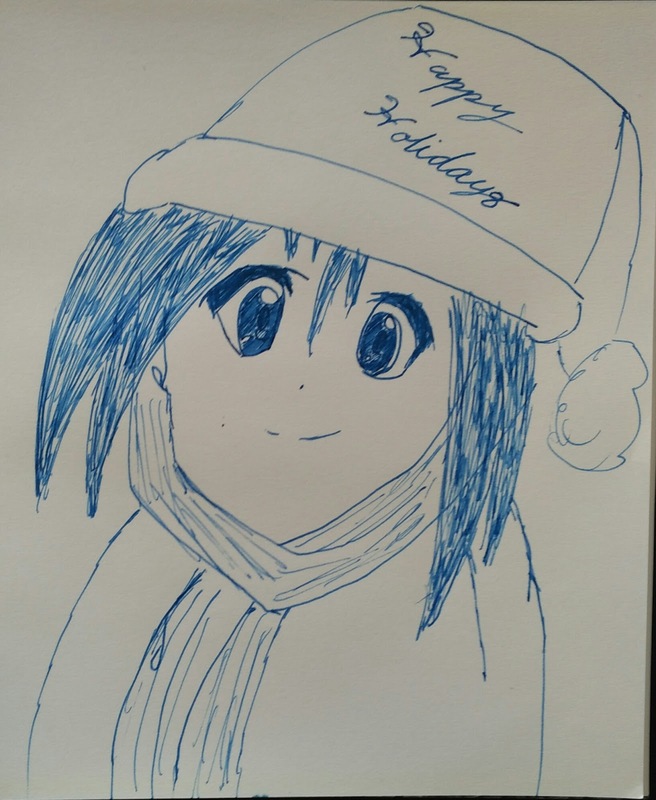 A quick run on lesser quality paper suggests that the pen is good for cheap papers, with no feathering or bleed through. With similar dimensions as the rest of the preppy family, the EF nib and section is also interchangeable with the Plasir for a more presentable look. Overall, I prefer the 02 nib over the 03 and 05 nibs. 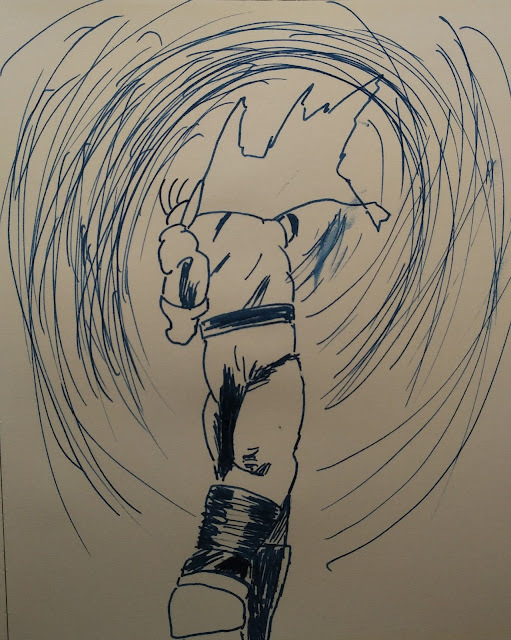 However, it does take some getting used to, and some knowledge of adjusting nibs is needed to get it working properly. 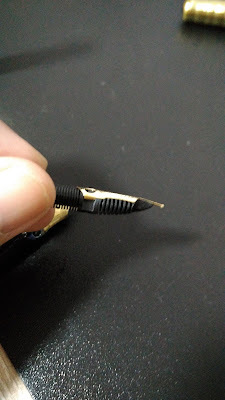 Beginners might want to get comfortable with the 03 and 05 nibs before attempting this nib. Compared to the rivaling pilot penmanship, I prefer the Preppy 02 for its shorter design and better out-of-the-box ink flow. 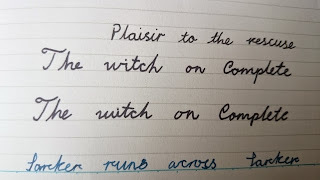 Review: The Witch, Combine, and Complete. In my never-ending quest to find inexpensive papers which are fountain pen friendly, I came across the "Combine" brand from Daiso, which is has a impressive good quality for its price. Another Daiso brand, "Complete", has a similar cover design but does not match up in quality, though the range of their paper products is wider compared to "Combine". Encouraged by a review by a fellow member in SFPL, I decided to try the "Complete" brand again, in hopes that their quality have improved. Combine is still much more fountain paper friendly paper hands down. 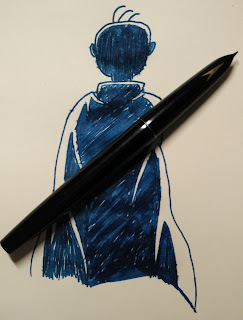 With hopes of redeeming the Complete brand, I also tried Parker Blue Black in a Parker 51 Fine nib, as well as a Platinum cartilage in a Plaisir 3.0 nib. 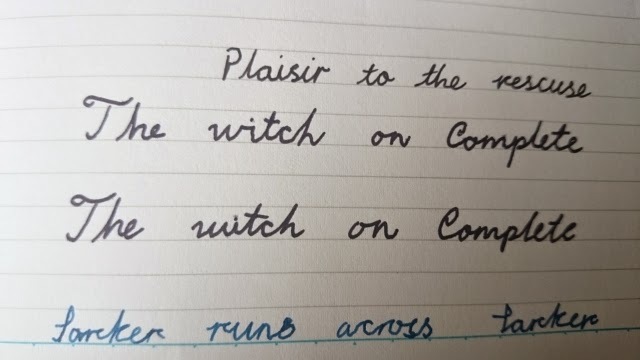 It seems that Complete will still work with dryer inks like Platinum and possibly Pelikan 4001, but I'll personally stick with Combine for now. By spamming me at the above email with useless ads, scams, etc, you agree to pay me everything you own, including the pants you are wearing.